Under instructions from my four nephews, I have ordered a half-baguette with roast chicken at a snack bar in the town of Beau-Bassin. The vendor asks 'Mayonnaise and chilli?' and waits for my answer from behind his glass counter and displays of stacked banana tarts, hot pink napolitains and lime gâteaux coco. In two otherwise foreign condiments and a question mark, he has captured an entire nation and the portent of flavours to come. After eight years, I'm back visiting Mauritius and struck by a maze of overlapping cultures, religions and customs. On my first night, my mother wished me goodnight with a warning, 'Remember the muezzin will wake you up at 5:20 and our church bells at six o'clock'. But jetlagged, I found myself listening to the mating calls of a lizard hiding behind the curtains. Everything is the same. Everything is different. On my previous visit, my father was dying at our family home. Four nurses, Mr Cannoossamy and Mr Armoogum, Tamil Hindus, and Mr Nepaul and Mr Angateeah, Indian Hindus, were taking turns caring for him. They spoke of English soccer while eating lunch under the verandah. Serving them, my mother was mortified, 'Only one piece of chicken? Did you eat before coming here?'. I like to refer to Mauritians as the Italians of the Indian Ocean. We are emotive, loud and obsessed with family and food. Now, the family home is sold, and from her apartment, my mother calls on Mr Joypaul, Mr Nazhir and Mr Bagby as her favourite taxi drivers. Mr Joypaul, the oldest, has known my mother — now a great grandmother — from their childhood. He picks us up in a comfortable air conditioned sedan, a far cry from the stifling black Morris Minor cabs of my youth with vinyl seats that would get so hot they would burn my thighs. Mr Joypaul reminisces about a picnic my maternal grandmother invited his family to at Mont Choisy beach in the early '40s when he tasted Tête de Maure cheese for the first time. Through his reflection in the rear view mirror, his smile to us carries the memory of a delight that dates more than 70 years. On the way to my father's grave, we stop at the bazaar to buy flowers. My mother bargains briefly in Creole with the florist who laughs and offers a special family price, 'Enn pri fami akoz ou'. On the way out along the spice stall, I catch a whiff of dried octopus hanging above and strung flat, and recall how I used to avoid the stare of their mummified, glaucous eyes. After the cemetery, we drive past our former family home. The new owners have extended the garage. The bottle palms from Round Island in the north that my father planted along the drive way more than 50 years ago are still there. On the roof stands the TV antenna my father would painstakingly take down at every threatening cyclone. Over the following weeks, locals stare at me when I take photos of rundown wooden colonial houses and shops, rickety buses and mundane vistas that I used to ignore. Now I see them as landmarks safeguarding my past and defining the Mauritian in me. 'Do you remember when ...', 'What's happened to ...', I find myself asking my mother and two sisters again and again. Growing up in a country referred to as a dot on the world map and isolated by vast expanses of water, the horizon quickly became a strong feature in my landscape. That line defined a safe edge to my tiny world, the only one that I knew. When my family went on a 15 minute boat trip within the lagoon to Stag Island for a picnic, I raved at school about having left Mauritius, 'gone overseas' and dared to set foot on a foreign land. As a young adult, that same horizon became a metaphor for the frontier that locked me in and that I needed to escape from. Leaving Mauritius for Australia changed everything and nothing. While I am now liberated from a suffocating horizon, I only need to step outside to sense the presence of a different horizon, one that sits instead as a formidable continent behind me. My understanding of home has also evolved. As a hyphenated migrant, my home does not have a main entry, but a few side doors. Mr Bagby, a Muslim, gave me that insight when he drove my mother and me to our parish church. 'It's windy. How about I take you to one of the side doors? You don't want to catch a cold sitting in a pew off the main aisle'. An eloquent piece. One can experiences something similar, in an attenuated way, when returns to one's home town or city -- especially if it is "interstate" -- after a long absence. Proust also wrote powerfully about it. Beautiful words, Bernard. 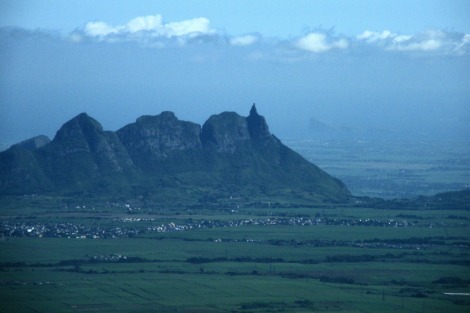 Nice to read about Mauritian culture - of which we rarely hear. Reminds me a little of Brian Doyle's writing. I love your use of the word "hyphenated" migrant. I,too, am a hyphenated migrant of 43 years. The last 10 have been spent in Mauritius, for family reasons. I, too, can relate to the same feelings about our homeland, so many changes and, at the same time, time seems to have stood still. Beautiful words, Bernard.